Here are some photos taken before the General Election on 23rd. February 1950 when a great deal of the transport used in the Brighton area was horses as petrol was still rationed. 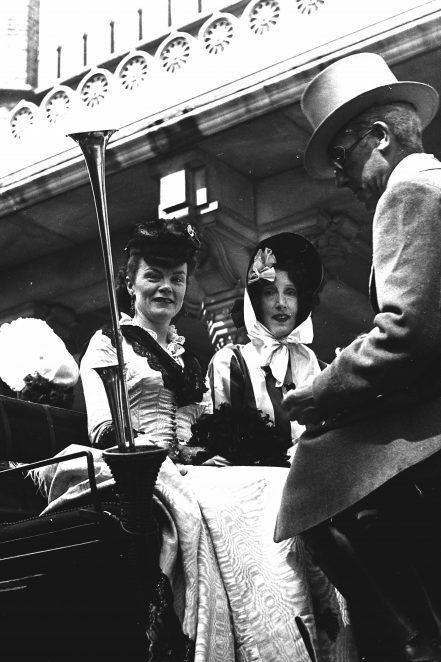 In the photo are from left to right Helen Rossetti – Ursula Purnell – Audrey Corber – Dorothy Cruickshank who wore fancy dress to promote the election. I wonder if you can identify the locations? If you can, please leave a comment below. Ladies in fancy dress Helen Rossetti - Ursula Purnell - Audrey Corber - Dorothy Cruickshank. Helen Rossetti and Dorothy Cruickshank. The second photo appears to be Grand Parade just south of the bottom of St James Street. The shop with the name plate attached is now I believe a travel shop or similar. I do know it has changed hands a few times since I was a kid living in Brighton. 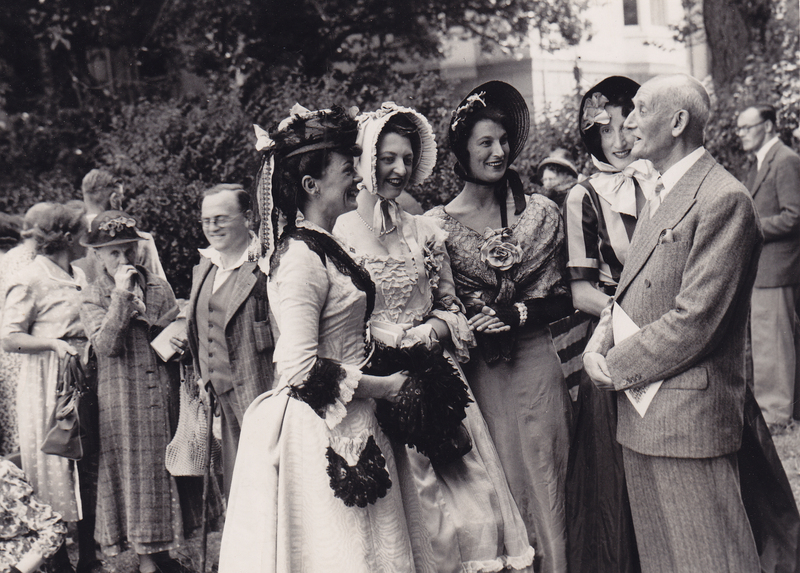 The fourth, and last, photo appear to have been taken outside the south entrance to the Dome building in the Pavilion Gardens, where the name Brighton Museum & Art Gallery now appears. I agree with Roger about the second photo being just south of St James’s Street. The buildings in view are (from left to right), J Lyons on the far corner of St James’s Street, St James’s Mansions on the near corner (with the Steine Street sign on the first floor side wall), and Nos 19 (now Very Italian Pizza) and 20 Old Steine. 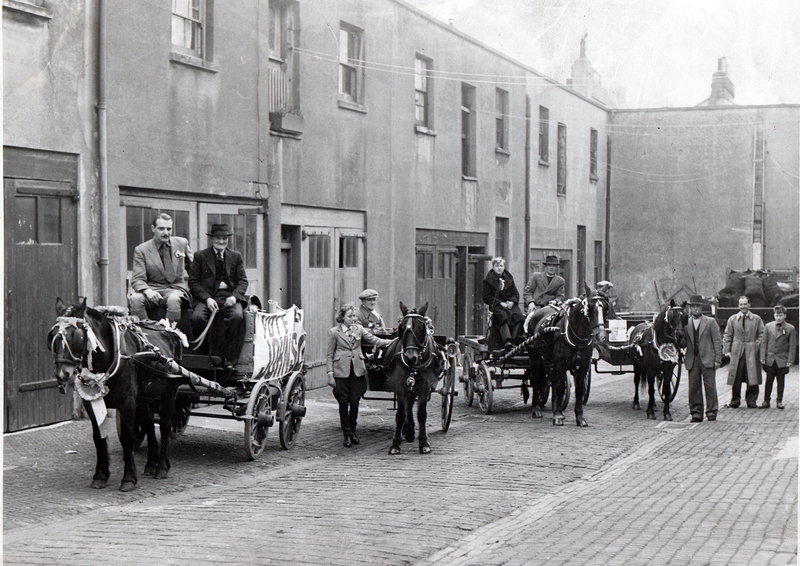 I would hazard a guess that the third photo was taken in the Jubilee Street area, where there used to be stables at one time. I initially thought the first photo could have been taken in the Pavilion Gardens, but the building in the background looks more like those in Grand Parade. This would make the setting Victoria Gardens, possibly near the bottom of Carlton Hill. The ground seems to rise from bottom left to top right, which made me think of Russell and Clarence Squares, but the building in the background shows the photo to be tilted, which accentuates the slope. Looking again at the first photo, I now think this was taken in the gardens at the back of the Royal Pavilion (Old Steine side) at the southern end, with No 3 Palace Place in the background. This building has the same type of bay windows, and the same architectural band between the ground and first floors. There is still a lamp post there at the end of Palace Place, in the same position too! The man in the suit at the front right of the photo, talking to the four ladies in fancy dress, has his back to the Pavilion. Where my mother and friends were dressed in Regency period costumes was in the grounds of the Pavilion. 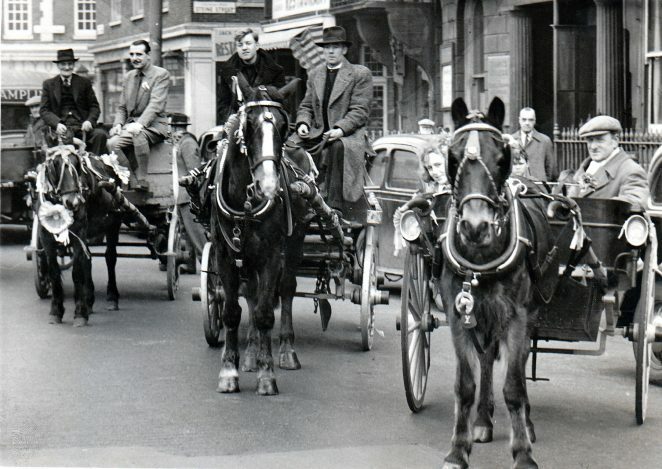 The stables were in Sussex Mews which is on Eastern Road near Sussex Square.